F and E were hands down the funnest couple this year. They were down for the party from the very beginning—this, mixed with their excellent taste, made it one of the most unique and memorable weddings I’ve ever planned. F after a night partying on the town was walking down high street with some friends when she spotted a cute guy hanging out on the side of the street. She went up to him…one thing lead to another and a first kiss followed. It must have been electrifying because the two have been inseparable for the last 10 years. F’s Italian heritage and E’s taste for all things Italian made Tuscany their choice to tie the knot. F and E chose villa di Maiano for their ceremony. 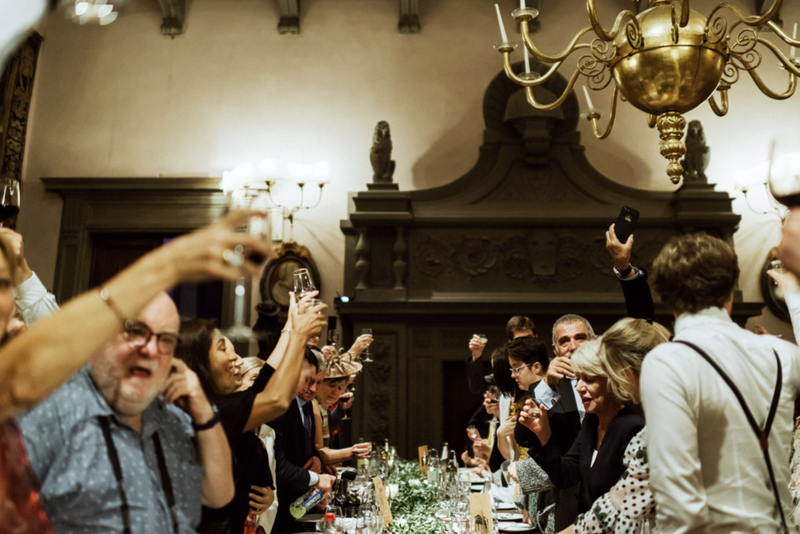 Originally they wanted a farmhouse venue where guests could sleep and their festivities could continue throughout the week…but one look at the stunning Renaissance revival venue overlooking Florence and they were in love. The beautiful thing about Villa di Maiano is its rustic charme and its size. Their are literally so many environs that one doesn’t know where to start. I love wedding venues that set a stage and progress throughout the festivities. This venue definitely fits the bill. The dress was made by Nepalese/English designer Sanyukta Shrestha. She is dedicated to ethical designs, in fact her motto is “Love green-believe in ethics”…this fits perfectly with our goals at Tuscan Wedding. The dress flattered F’s full figured bust in antique white. Her look was complemented with a stunning pair of rhinestoned chandelier earrings by Christie Nicolaides. Sophia Webster designed her gold healed slippers. The look was classic, elegant and boho at the same time. 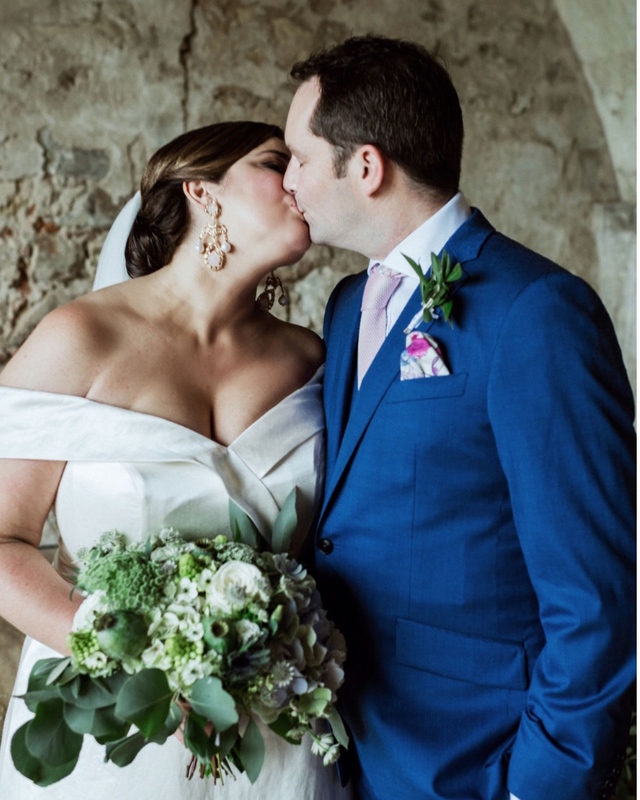 I don’t normally post about the groom’s clothing but E was styling with his deep blue suit with gilet by Edit suites. He complemented the look with a brown pair of leather shoes by Loake, a blush patterned tie, and floral motif pocket square. I give it 5 stars!! Groom’s normally rent suits and this is a huge mistake. A bride may wear her dress only once but a groom can wear a nice suit for years to come. Baggy rented suits = bad ; nice tailored custom suits = good. The Bridal party wore sleek and elegant black gowns with gold accented jewelry. Her cute flower girls…that’s right she had more than one… wore beautiful white dresses and olive branch crowns. The groomsmen wore charcoal suits with grey linen ties. It’s not a surprise that F and E had tons of family and friends travel from all corners of the earth. I loved the fact that everyone had a relationship with the bride and groom. Sometimes you get random relatives that just show up but this wasn’t the case. Everyone there definitely wanted to be there and F and E made them feel special for being there. Our original plan was to have the ceremony in the villa’s olive grove…overlooking the city—quite an otherworldly scene— but fate had another plan for us that day. It rained and rained the entire day…at the last minute we decided to move the ceremony indoors to the villa’s lemon house. I have to say that this is a special spot. The windows overlook the Italian garden which overlook the city. The rustic walls and windows gave it that boho chic mood F and E were looking for. F called me that morning and asked if we could move the lights for the dinner into the lemon house to give it a magical feel…I have to admit I was a bit dubious but in the end it was stunning. Sabrina and I lit candles throughout the lemon house and placed loose greenery at the front of the room. The villa had beautiful chairs which helped tie the look together. Even though the weather was poor it was still quite warm and a gentle breeze swept through the room. F walked down to a Beatle’s song which fit her personality to a tee. M, F and E’s close friend, conducted the ceremony—it was funny, it was moving, it was emotional and it was perfect! It wasn’t what we originally planned but in the end it really was the best plan. My plans for an epic imperial table on the villa’s terrace overlooking Florence were foiled due to the poor rainy weather. We had to go with plan B and move the dinner inside to the villa’s stunning ballroom. The bride’s brother kept the guests in stitches with his wise cracks about the couple throughout the evening. One of my favorite moments was when the groom and the bride’s brother appeared at the top of the room’s balcony and saluted the guests. E’s heartfelt toast to his bride brought a few tears to my eyes…not an easy feat. Each guest sat at a table with various Florentine monuments. Guests enjoyed caccio e pepe and pasta al pomodoro served family style for the pasta course and beef tagliata, salad and potatoes for the meat course. It was a truly Florentine night. The cake was its own show stopper. I put top priority on food quality and loved to find out that E and F felt the same way. On one of their visits we had brunch at Giorgio Pasticceria in Florence and I had them taste Giorgio’s famous mille foglie cake. Some of Giorgio’s recipes are so secret that only one person knows them…when they are made everyone must leave the kitchen while the chef, Massimo, prepares them. Massimo went above and beyond with this 3 tiered beauty, filled with custard and topped with fresh berries. I finished the look by placing white roses on the various tiers. Needless to say not even a crumb remained after the guests feasted on this delicious masterpiece. What and epic after party. The couple hired Alma Project for their amazing music and lighting service. A sax called all of the guests onto the dance floor from the ballroom. Guests walked into a stellar DJ, amazing lighting and a sax and drum player playing along to the music. Literally everyone was on the dance floor. The party went into the wee hours of the night. A perfect ending to a perfect day.